Do you care for monthly data usage of your iPhone or Android mobile phone? If you have unlimited data usage plan, don't read this. Else you must go through it. Most of the Smartphone users have limit on their monthly data usage irrespective of the service provider. You can easily calculate the total data used and the remaining quota of data you have, but it does not give any idea of which application of your mobile phone is using the most of that data limit. Opera mini is other option as a mobile browser which compresses the web page and renders the page at mobile side saving around 90% data. But this is again a single application in the jungle of Apps you have installed on your smartphone those contributing to data usage. Using Opera mini can’t come to help if you really want to reduce and monitor total data usage across all the applications installed on your mobile. Most of the applications installed on cell phone are keeping accessing data network in background even they are not in use and such applications easily finish your data limit. Applications for streaming video, music, VOIP consume most of the data. So how you can monitor which application is using most of the data limit, so that you can easily keep the data usage under your control. Compressing the data transfer is also possible in iPhone on all the application just like Opera mini. Onavo is free application you can use on iPhone and Android mobile to do all you want to monitor and minimize data transfer on internet across all the application. Onavo runs in the background and quietly saves you data and money without interfering normal mobile use. In-depth reports show application wise data use, so that you can select good applications. Simple to setup and easy to use. Runs in the background, reporting data usage and compressing downloaded traffic. Compressed data make your data plan to last longer and saves money. Easily find out which application using more data and type of use costing you more. Use it as a Internet data calculator, get detailed data use statistics. 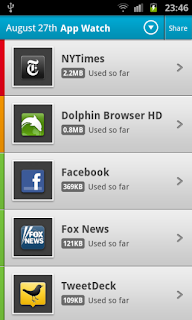 Usage widget shows which app using data right now, Live. Data usage report provides usage chart hourly, daily, weekly and monthly charts to analyze the data use. Onavo give status notifications about apps that are hogging data, when approaching your data cap. Data hog blocking. Restrict specific apps to WiFi, or block your 3G data once you exceed your data cap to avoid any additional costs. It works on all type of networks including 3G, 2G, Wi-Fi, and CDMA. That is very useful info. But, if you are going to write articles you should work on your grammar. Thank you for your valuable suggestion. Now I will pay attention toward the grammar.